Over the weekend, I went to New York City to see Cinderella with a whole bunch of friends. Everyone knows, New York City is no stranger to good food, and since I, also, am no stranger to good food, I decided to share my experience at "HB Burger", located in the heart of Times Square! After a long day walking through the city, in the snow, no less, I was super excited to eat (although, I think I'm always super excited to eat). We all arrived -- Andrea, Jessica, Melissa, and I were getting a table because we were meeting my cousins Dom and Mike, as well as Jessica's boyfriend, Sam, and his roommate, Adam. For a Saturday night in New York City, I thought this place was pretty slow. We had to wait, but we were the only ones waiting, and it was only because we needed a table for eight. While we waited, I took a look around. I really liked the ambiance. The tables were not terribly close together (which is always a pain), and a mural-sized menu was posted on the wall. I also liked the hardwood decor mixed with the black accents. After being greeted by the hostess (who I should, from here on out, refer to as Les Miserable), we told her we would need a table for eight, fully expecting that we would have to wait. "Oh, well you're gonna have to be split up," was all she said. I'm no expert, but a more acceptable response may have been, "Is it okay if I split you up?" Listen, I know what it's like to be on the receiving end of annoying people wanting to be seated. I did it for years and years. However, we were not annoying, in fact, we were very undemanding. When I asked if we would be near each other at least, she said no and "that's all we can do for you." Hm. At this point I was getting angry, so much so, that I had to walk away and let someone else talk to her. There were (2) two-top tables, and (1) four-top table in a row against the wall, so I asked if we may have those tables pushed together when the people at the four-top got up. She just shrugged her shoulders and said, "I guess." Not 5 minutes later, she sat a couple at one of the two-tops, making it impossible for us to seat 8 there now. We ended up sitting elsewhere, but I couldn't stop thinking about the hostess all night. Fast forward to the meal, which was actually quite good. The girls shared three different appetizers: Tater Tots made with Jalapeno Jack Cheese and Bacon, Provolone Sticks, and Buffalo Chips. 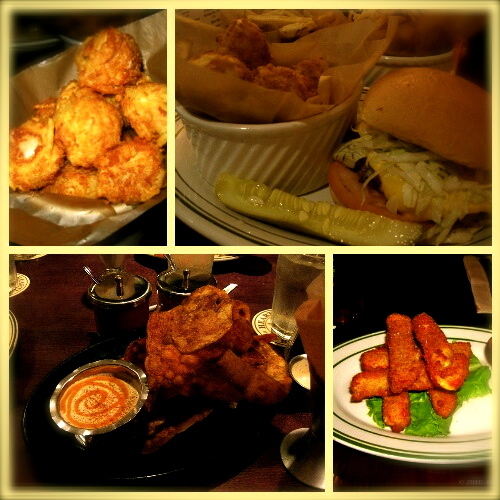 The tater tots (top left photo) were phenomenal. They were like little bites of loaded baked potatoes. The bacon, the jack cheese, everything worked so perfectly together. They were also so crispy on the outside and warm and gooey on the inside. I wanted 75 more, at least. The "provolone" sticks (bottom right photo) were just that. Nothing spectacular here, and I imagine they were frozen and fried. Although, they were perfectly melted on the inside. The buffalo chips (bottom left photo), however, were very good. They seemed to be house-cut potatoes that were seasoned with a spicy Cajun seasoning and fried until very crisp. They were also served with a Buffalo-Ranch dressing. The cool, creamy Ranch paired perfectly with the spicy potato chips. Now, for the burgers. I feel obligated to complain about the fact that the burgers come with absolutely nothing. Seriously, I'm surprised you don't have to pay extra for your bun. Cheese is a whopping $1.75, which they probably can charge that price because who isn't putting cheese on their burger? I opted for the Veggie Burger, which is described on the menu as "house made with black beans, brown rice, quinoa, lentils, 7 kinds of veggies, and our mix of garden herbs and spices, topped with tomato chutney." I'd like to start by saying the burger was quite delish. It was a nice size, it was tasty with just the right bit of spice, and since it was made out of all vegetables, I felt a little bit better about eating 3 cheese sticks, a loaded tater tot, and all my fries. I built my burger with Jalapeno Jack cheese ($1.75), avocado ($1.75), and "onion marmalade" (on the house). When we got our food (which took an exceptionally long time for it being as slow as it was), my burger came with the onion "marmalade" on the side, as I asked, however, it was seriously just sauteed onions. Nothing "marmalady" about it. And I think the term "marmalade" should be reserved for fruit spreads. The very soft potato roll was a great vessel for the burger, but it would have been nice if it were toasted; since the burger was so juicy, the roll basically melted away. The burger was one of the softest burgers I've ever eaten (more than likely because it was made of rice and beans), and the avocado worked really well with the whole thing. It added that cool and creamy consistency -- just what the burger needed. The "tomato chutney", however, was simply tomato paste slathered on the roll, which wasn't entirely pleasant. As for the service, it started with "Les Miserable" the hostess, but our server was quite nice. He had a nice, friendly attitude (as opposed to a sour apple attitude) and was helpful when need-be. He was very slow to bring out drinks and food, but we were all having such a good time, I don't think we noticed the time passing. 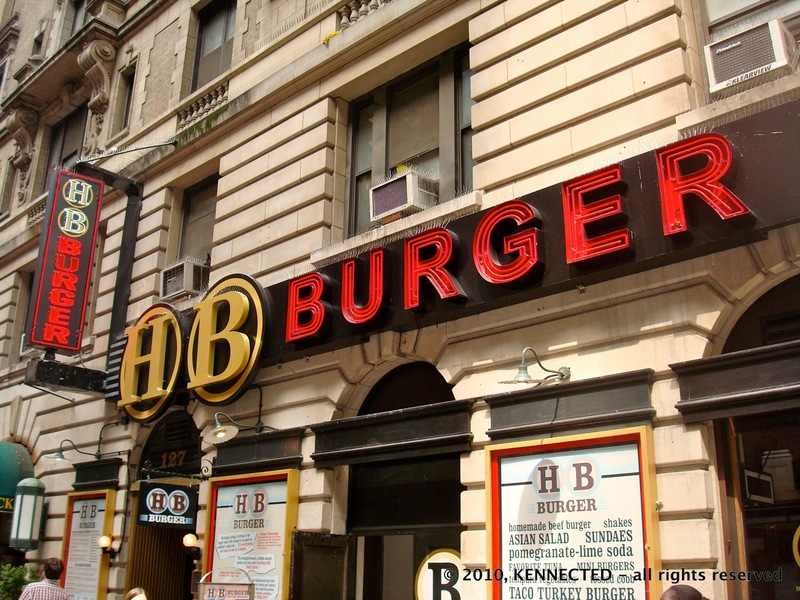 All-in-all, I would go back to HB Burger on my next trip to NYC. I really wanted to try the Bison Burger, the Buffalo-Beef Burger, and the Crab Cake Burger - which Melissa had and said it was really good! Check out their website to see the full menu!